New Orleans is a city of neighborhoods. Picture Faubourg Marigny with its Creole cottages, the Irish Channel with its double shotgun houses or Broadmoor with its raised basement bungalows. Each has its own identity, derived in large part by its distinctive architecture and the people who settled it. Development of the area got a jumpstart in 2010 when the Domain Companies announced that it would build new mixed-use buildings on four square blocks then occupied by surface parking lots. Spurred by the construction of the Loyola Avenue streetcar and the development of the biosciences district surrounding the new University Medical Center complex, Domain set out to transform what preservationists had long lamented as the “parking lot district” into a walkable neighborhood featuring dozens of urban amenities. They have succeeded so well that the term “South Market District” is now used to describe the new neighborhood, not just the five square blocks at the center developed by Domain. With that in mind, we’ve compiled a guide to New Orleans’ newest neighborhood so that you’ll be in the know about what it has to offer. Think of this set of lists as a starting point and use it to explore on your own. 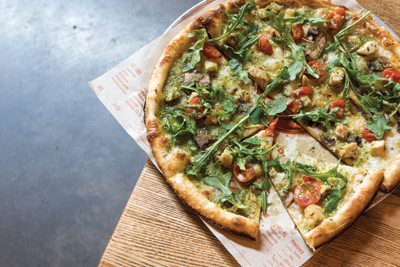 (611 O’Keefe Ave., BlazePizza.com): Fast-fired, custom-built, artisanal pizzas by this national chain keep company with artful salads and a “s’more pie” for dessert. (Entergy Centre, 1100 Poydras St., AllegroBistro.com): The long-time restaurant anchor on the ground floor of the Energy Centre offers Creole inspired dishes in an upscale Art Deco atmosphere. (833 Howard Ave.): A favorite lunch spot for nearby office workers, this order-at-the-counter venue offers a vegetarian and health conscious menu. (930 Poydras St., JohnnySanchezRestaurant.com): This chic Mexican restaurant operates under the flag of celebrity chef John Besh and business partner Aarón Sánchez. (916 Lafayette St., CellarDoorNOLA.com): Housed in the 1830s-era Swoop-Duggins house, a former brothel, this gastropub exudes a clubby atmosphere while serving swanky small plates and fine spirits. (640 Carondelet St., BaliseNOLA.com): James Beard nominated chef Justin Devillier opened this downtown offshoot of his Uptown staple, La Petite Grocery, to feature Louisiana fare accented by European style. (909 Poydras St., EatCityGreens.com): Seasonal, hydroponically grown greens are the focus of this salad bar, where wraps, juices and soups are also on the menu. (611 O’Keefe Ave., TheCompanyBurger.com): National award-winning burgers are served with shakes and fries at this downtown outpost of chef Joe Biderman’s Freret Street flagship spot. (900 Poydras St., JimmyJohns.com): Saints quarterback Drew Brees owns this chain restaurant that offers subs, club sandwiches and signature fries. (515 Baronne St., JuansFlyingBurrito.com): The popular locally owned restaurant’s third location offers burritos, enchiladas, margaritas and tacos. (920 Poydras St., Horinoya.Weebly.com): The family-run restaurant features traditional Japanese fare including sushi, sashimi and specialty rolls, plus some surprising specialty dishes. (611 O’Keefe Ave.): The owners of Magasin Uptown (MagasinCafe.com) opened this downtown counterpart, where they serve Vietnamese fare including pho, bun and bánh mì. (930 Poydras St., Reginellis.com): One of several locations of the locally owned Italian bistro, the restaurant offers pizzas, sandwiches, salads and pasta dishes. (611 O’Keefe Ave., WillaJean.com): Chefs Kelly Fields and Lisa White have collaborated on a “contemporary bakery” with Chef John Besh purveying Southern food (think shrimp and grits), baked goods, specialty coffee and cocktails. Residents of the South Market District tend to walk to restaurants, bars and the grocery store, but even in this pedestrian-friendly neighborhood, workouts help with staying in shape (and meeting neighbors). (611 O’Keefe Ave., barre3.com): Fitness classes at this studio combine principles of yoga, Pilates and ballet barre to tone and strengthen major muscle groups while increasing heart rate. (901 Carondelet St., CrescentCityPilates.com): The facility offers both traditional and non-traditional Pilates based on human anatomy and biomechanics. (733 St. Joseph St., IronTribeFitness.com): Forty-five minute fitness classes at this membership venue are aimed at improving health and athleticism. South Market District teems with new residents and investment, attracting an increasing number of retail establishments. Some of the newest shopping ops include furniture stores, accessory shops and clothing boutiques. (611 O’Keefe Ave.): Clothing inspired by the 1960s and ’70s takes center stage at this shop for women. (939 Girod St., Arhaus.com): The sophisticated furniture store with a national presence features handcrafted, one-of-a-kind designs for the home environment. (939 Girod St., HattieSparks.com): The boutique’s collection of home décor, clothing, cosmetics, jewelry, books, art and gifts has been carefully curated to appeal to urban dwellers. On the fringes: Dozens of art galleries in the vicinity of Julia Street in the Warehouse District. How many times have you heard residents of other neighborhoods bemoan the lack of an accessible, well-stocked grocery store? Never in the South Market District. (701 Baronne St., Shop.Rouses.com): New Orleans residents from the neighborhood and beyond flock to this store for its selection of wine and spirits, deli, bakery, meals to go and seafood. On-site parking makes it easy to access. Downtown New Orleans, including the French Quarter and Warehouse District, are magnets for music, theater and performance-lovers of all stripes. The South Market District fits right in. (510 O’Keefe Ave., CivicNOLA.com): Built in 1906, the historic theater has been meticulously restored and re-opened as a venue for music concerts and more. On the fringes: The Orpheum Theater (129 Roosevelt Way, OrpheumNOLA.com); Canal Street’s Joy (TheJoyTheater.com) and Saenger theaters (SaengerNOLA.com); the Little Gem Saloon (445 S. Rampart St., LittleGemSaloon.com); Champions Square at the Superdome (Champions-Square.com); Lafayette Square for free “Wednesday at the Square” concerts in spring and fall (WednesdayAtTheSquare.com). Developers of the South Market District led the way in that area of downtown with The Paramount and plan to develop additional apartment and condo buildings, including The Beacon (124 apartments and retail now under construction) and The Standard (89 condos and retail). (O’Keefe Avenue and Girod Street): Offering 209 apartments with access to The Park, a five-floor garage for bikes and cars providing electric car charging stations, and both bicycle- and car-sharing programs. Hallmarks of the savvy urbanist are well-designed hair, carefully cultivated skin and properly groomed nails. (720 Carondelet St., BuffBeautyBar.com): Everything an urban dweller would want can be found here, including manicures, pedicures, brow and lash tints, waxing, make-up and face peels. (625 Baronne St., NikiWalkerSalon.com): The salon offers hair care services, including cuts and coloring, for male and female clients.